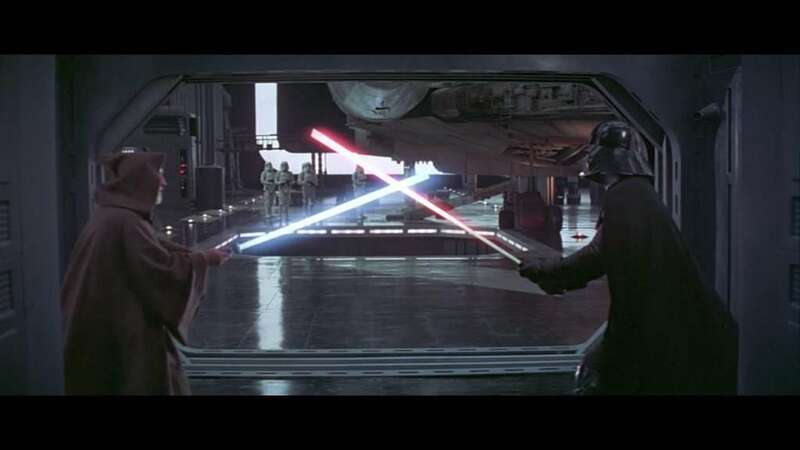 I thought it would be nice to offer my opinion on the best lightsaber battles in the Star Wars saga. Hopefully you guys will have your own opinion and can rank yours in the comments. For the purpose of this list I have only included the final lightsaber battles from the actual films. So, no mid battles such as Obi-Wan vs General Grevious and no animated series are included. I have ranked them from worst to best, and remember, this is only my opinion and probably doesn’t follow the overall consensus! Where to start with this one! 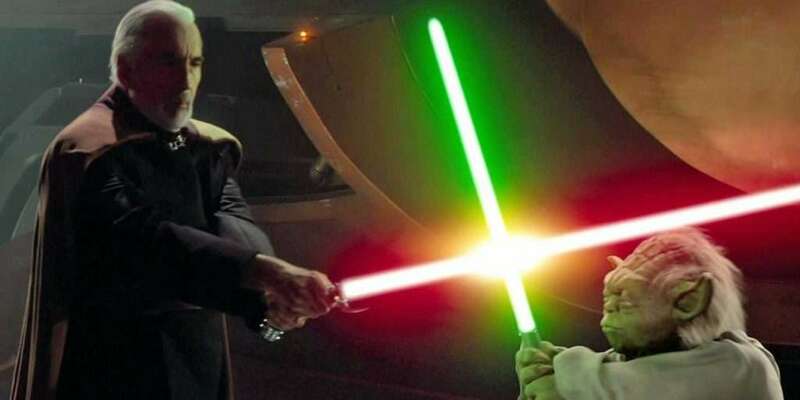 I am not a huge fan of Attack of the Clones in general so it came as no surprise to me that the final lightsaber duel is last in my list. The two ‘heroes’ just seem so weak against Count Dooku who although powerful is still an old man. Anakin shows his immaturity by rushing in and gets forced pushed against the wall leaving Obi-wan to take Dooku on by himself. You would think that this wouldn’t be a problem when you take into account how he dealt with the acrobatic Darth Maul in The Phantom Menace. But no, Obi-Wan is soon out of the fight with a scratch on the leg. Anakin gets himself back in the game just in time to save Obi-Wan but then quickly loses an arm. In hobbles Yoda, who then proceeds to jump about like a rabid goblin only to hobble again straight after. Now I know this scene splits a lot of fans, with some really pleased to finally see Yoda in action with others finding it all a bit silly. I’m in the silly camp! I would much rather they kept Yoda as a wise old Jedi who didn’t really get involved in the actual fighting. I am sure he kicked arse when he was 100, but 840ish I am not so sure. Anyway, for me, the final duel in Attack of the Clones deserves to be last place. O.k, so this duel is pretty epic and has some decent cinematography but for me it just goes on slightly too long. It certainly has plenty of emotion and I enjoyed the dialogue between Obi-wan and Anakin, but the fight scenes are repetitive due to the overall length of the duel. 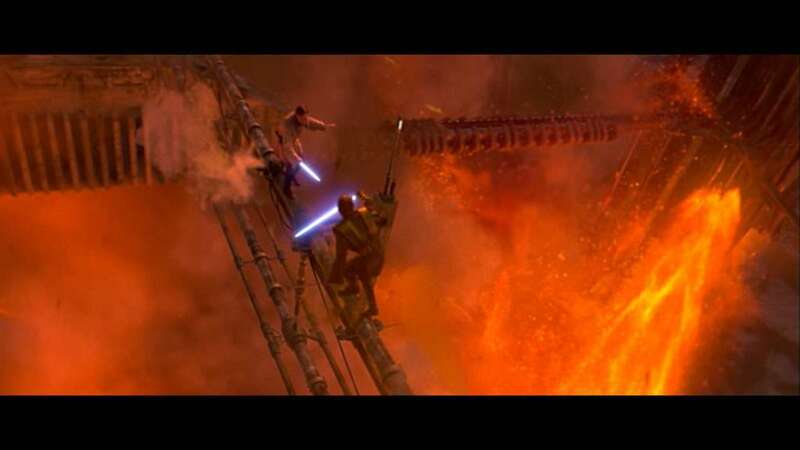 Perhaps some of the scenes were slightly over the top too- specifically the scene where they are swinging about on the giant piece of metal that’s floating in molten lava. This is where it starts to get a little more difficult to rank them because from here on in I like them all. I really enjoyed the final duel in the Force Awakens with my only complaint being that Rey seems overly skilled without any real training (perhaps we find out why this is in The Last Jedi). Looking past that, the fight scene itself is nicely shot with some great lighting in the snowy woods. The emotional stakes are high for all concerned. Finn being called out as a traitor, Kylo is injured and has just killed his own father. Rey has just lost her father figure and must accept the Force. 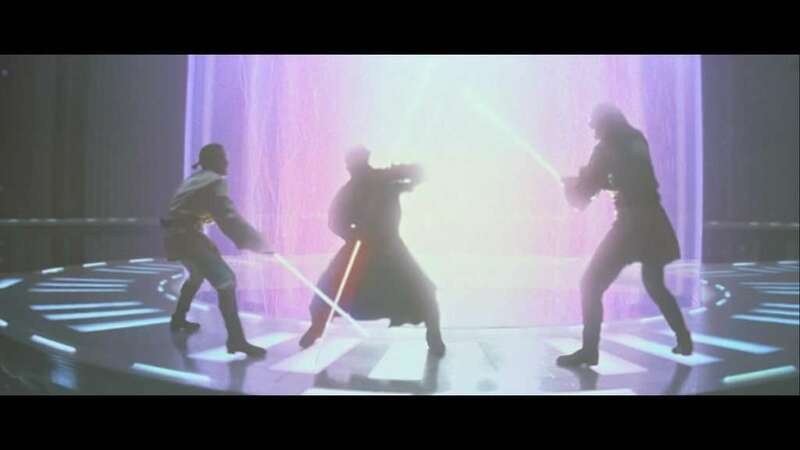 Ok, so this famous lightsabrer duel isn’t as energetic as the others, but what it lacks in energy and speed it more than makes up for in emotion and mysticism. The action is slow and precise, which I didn’t mind at the time and it still doesn’t bother me now. To me it’s more a battle of the minds. Vader playing on the fact that he is more powerful and that Obi-wan is now an old man, whilst Obi-wan knows that if he dies he will be able to influence Luke more than he could if he was alive. Obi-Wan sacrificing himself still gets me every time; you can really feel Luke’s loss. This one being third place might surprise a few but it’s now getting really difficult to separate them. So much happens in this duel and in many different settings. The start of the battle begins in the atmospherically lit freezing chamber where Luke narrowly escapes being frozen in carbonite. A gorgeous mix of reds and blues really set the tone. The fight moves out to the corridor which was reused in Rey’s ‘Forceback’ vision in The Force Awakens. At this point Luke is visibly weakened, with Vader using the force to hurl large objects at him resulting in Luke being sucked out of a large window. A little more lightsaber jostling before Luke loses a hand. We then of course have the big reveal (Spoiler alert) of Darth Vader being Luke’s father. I love The Empire Strikes Back and I love the final duel but it was obvious that Luke was nowhere near ready and Vader just toyed with him, without ever wanting to really hurt him. Many Star Wars fans have issues with the prequels and I am no different. It’s safe to say that for the most part they didn’t live up to expectations. However, there are some good bits, and the Duel of Fates is right up there. This for me has everything I want in a lightsaber battle. Speed, athleticism, passion are all there, not to mention the best bad guy since Darth Vader. The biggest mistake George Lucas made (Other than the Midichlorians and Jar Jar Binks) was Darth Maul not getting nearly enough screen time, and ultimately being killed off way too early. The little screen time he did get however was incredible. The moment the double doors to the hanger open and the Duel of Fates music kicks in, you know you are in for a treat. The double lightsaber, the acrobatics, incredible set and the emotion at the end, it really does have it all. It almost makes top spot for me with the only let down being the death of such a great baddie! In first place is the final duel between Darth Vader and his son Luke Skywalker. Return of the Jedi was released when I had just turned six. It was the first Star Wars film that I saw on the big screen so I have a natural fondness for it. I was too young to be annoyed by teddy bears beating Stormtroopers with sticks and rocks; I was just in awe of the speeder bike chase, cool looking biker scouts, intense space battle above Endor and a truly awesome lightsaber duel. 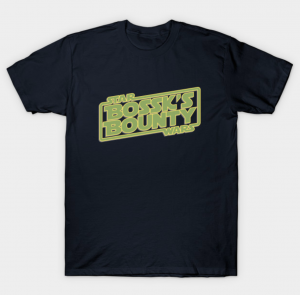 Luke’s desperate attempts to avoid fighting his father and turn him back to the good side end in failure. The hold the Emperor has on Vader is just too strong. As Vader emotionally informs Luke ‘It is too late for me, son’. The battle itself is pretty fast paced for its time with Luke showing off his more advanced skills. Luke is ready to face Vader this time, but not without coming very close to the dark side of the force. The Emperor knows he needs to make Luke angry to force him to fight and uses the plight of Luke’s friends as bait. Luke bites, albeit without much choice. The final straw comes when Vader threatens Luke’s sister Leia sending Luke into a mini rage. He then uses this anger to defeat his father. The emotion in this part of the duel is what makes it for me with the music setting the tone perfectly. I am also a sucker for a green lightsaber. Darth Vader now lying in a heap, missing a hand looks a sorry state. Luke, looking at his own glove-covered mechanical hand, realising just how close he came to the dark side. Vader then redeems himself by saving his son from the hands of the Emperor. What a fantastic lightsaber duel and perfect end to an amazing trilogy! So there’s my list, let me know yours in the comments!